If the place was devoid of people yesterday, when the market came to town while we were asleep it brought with it throngs of customers as well. Markets are one of the great mysteries to us. We wonder if anyone buys the cheap clothing or obscure gadgets from the swarthy gents in the white vans, and if they do what motivates them? 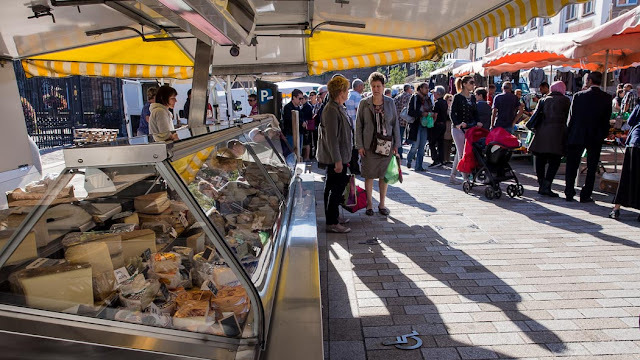 The food stalls are often sensationally diverse, with a wondrous mix of produce, mostly locally sourced and sometimes of stupendous freshness and quality, but without local knowledge bargains are rarely to be found among them. That’s not the game. In the same street there are wondrously well stocked cheese shops and delicatessens which are open every day, selling the same products and just not in the cold of the morning, but somehow it just tastes better if it is bought on the street.